Over 2 million people have read the #1 New York Times bestseller Wonder and have fallen in love with Auggie Pullman, an ordinary boy with an extraordinary face. Readers have also been treated to three stories offering a special look at Auggie’s world through new points of view. Previously only available in ebook, now they’ll be published all together in a gorgeous hardcover package! These stories are an extra peek at Auggie before he started at Beecher Prep and during his first year there. Readers get to see him through the eyes of Julian, the bully; Christopher, Auggie’s oldest friend; and Charlotte, Auggie’s new friend at school. 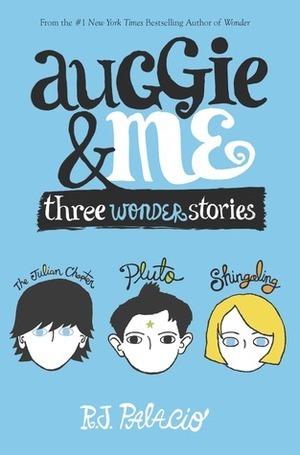 Together, these three stories are a treasure for readers who don’t want to leave Auggie behind when they finish Wonder. "Agguie and Me" adds more different points of view from the book of "Wonder", both books are written by R.J Palacio. It's a great book since the beggining 'til the end. I loved it. This story shows the points of view from Julian (the bully), from Christopher (his childhood best friend), and from Charlotte (her classmate) and it's interesting to know if they really are how they seem in the book of "Wonder". In this book it's interesting to know their way: is Julian a bully? Is Christopher right to hide Auggie from his new friends? Is Charlotte nice or was she just pretending? I really like it and I completely recommend it to you. An insightfull sequel to Wonder. I enjoyed hearing the characters different points of view and going to deeper into their stories. Jessie L.